Recently I came across a situation where data was being delivered at different times for different countries and client wanted to see data for latest common month in Region/Continent level reports. Data arrive on monthly basis, but it arrives at different dates for different countries. 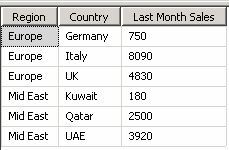 So, at one point in our data warehouse, we have Dec-2014 data for UK and Qatar. Rest of the countries have fallen behind them (having data for up to Nov-2014, Oct-2014 etc.). Let’s analyze in more details. First, let’s go into the cube. We have a simple Geo hierarchy. Countries are at lowest level and its parent is Region (Europe, Mid East). We have a simple month dimension as well. Its primary key is the digit produced by concatenating year with month. So, Dec-2014’s key will be 201412. It’s perfectly alright for country level sales . But, it will be interesting to analyze Region level sales. Actually, for regions, most of the business users would like to see common latest month’s total sales. In our data, Europe’s last month’s sales 4830 is probably giving the business user a wrong picture (of course it depends…. ), because only UK data is available for Dec-2014. So showing a total for Dec-2014 may not make much sense. Latest common month for Europe is Nov-2014 and latest common month for Mid East region is Oct-2014. So, it would always make much sense if we show Nov-2014 total for Europe and Oct-2014 total for Mid East. To support this requirement of showing common latest month’s sales I have introduced another fact. This fact is nothing but a storage for country-wise latest month. This Fact table’s name is FactCountryMaxPeriod and declared a simple count measure called [Measures]. [Fact Country Max Period Count] from it. We are almost done. Just declare a new calculated measure called [Measures]. [Common Latest Month Sales] and see it in cube browser. 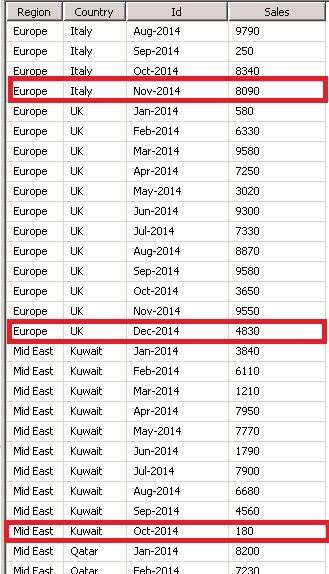 This time, Europe and Mid East is showing total sales of Nov-2014 and Oct-2014 respectively. 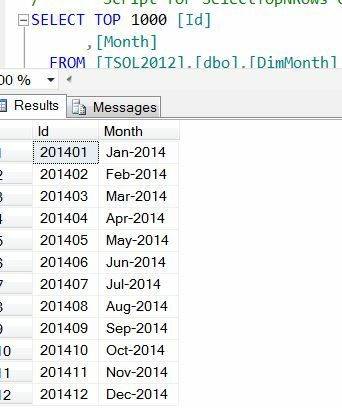 This entry was posted in MDX, SSAS (Analysis Service), Cube and tagged common month, common period, latest month, latest period, maximum month, maximum period, OLAP cube, ssas. Bookmark the permalink.